The title of this post might be a bit premature as we still have 4 official weeks left until the kids leave, but actually they won't turn up for the last two so I feel now that the end is nigh. I have to say I'm already feeling a bit sad about it. In Korea I only ever got to know the kids for 10 days at the most, so its been a new experience for me teaching 26 students for a whole year. As you might remember, at the beginning I absolutely despised the boys here. They were so undisciplined and rude that it was horrendous. But through a slow and steady drip of kindness, humour, rewards and a LOT of smack down, I now have lovely students who listen to me, enjoy my classes and crack me the hell up. A recent spelling word was 'moist,' which I explained by saying it meant 'a little bit wet.' The students looked confused so I elaborated by adding that it's like the wet stuff on your head after you play football. So now, every time they come in from break, they show me foreheads and sometimes even arm pits, and say 'teacher, I have moist!' It just makes me laugh every time. The girls class have been a constant throughout the year. Screechy, needy, full of endless stories, but also sweet and easily amused. 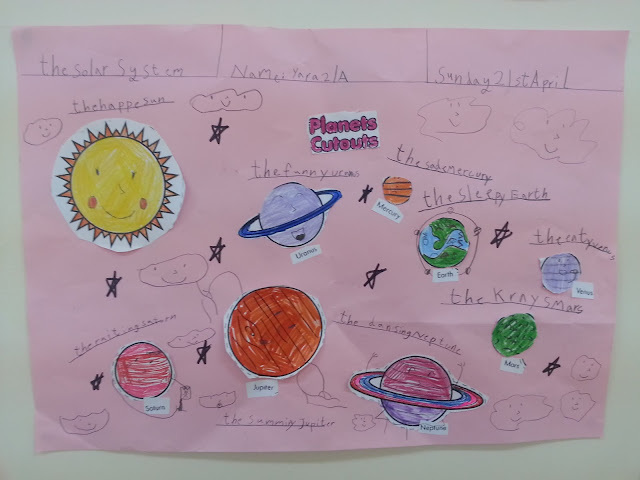 This week they cut out and coloured planets and I set them homework to write about the solar system, to present to the class the next day. The solar system consists of the sun and its planetary system of eight planets, their moons and other non-stellar objects. It formed 4.6 billion years ago from the gravitational collapse of a giant molecular cloud. It went on for another 100 words or so; you gotta love the old copy and paste from the internet. She told the class how each of the planets were feeling. The Earth is feeling sleepy, Neptune is feeling dancing, Uranus is feeling funny. I stopped her halfway with a subtle 'Thank you Yara, that's great,' but she responded with 'teacher, I not finish.' Then she carried on until she'd read everything on the page. Sometimes this job is too funny. There are moments where I want to kill someone and overall it's been a real roller coaster, but that's mainly due to the staff and the company. One thing's for sure, when I leave I'll really miss the little monsters that have made this place worth coming to.